The MFI Front Hooded SIG 550/1/2/3 Swiss Style Sight is basically a direct copy of the original except in aluminum. The sight main body and flip up blade are made from 7071 T-6 Aircraft grade aluminum and are precision CNC. I choose aluminum over steel due to the cost effectiveness and versatility of the material. Obviously it would be pointless to make an identical sight to the original & have it be the same price or even more expensive. Additionally 7071 T-6 aluminum can accept a Military Spec. Hard Coat Anodized Finish making it very durable. 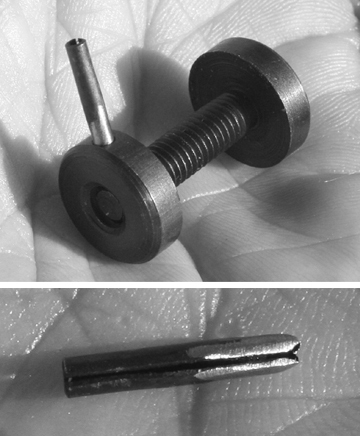 The cross over windage adjustment wheel / donut and bolt are weapons grade steel and have a Mil. Spec. Black Oxi coating. The Front Sight Fiber Optic Blade that flips up and down is interchangeable with an Original Swiss SANs Flip Up Blade with the Tritium insert. So “Yes” you can swap out the MFI blade for a SIG one if you so choose. Note that like all flip up fiber optic or tritium blades... the MFI blade is taller than the stationary front post / blade. I am not sure why SIG and for that matter everyone on the planet does this… I just choose to follow suit. In our case it does allow more light in and thus makes for a much brighter aiming point. Regardless of your choosing to have the fiber optic or not the flip down blade will come with the sight. The Finish on the MFI Front sight is black only. This is because of the volume we expect to do is 95% black rails. Mil. Spec. Hard Coat Anodizing takes paint very well so if you want yours to be painted... Have at it... Personally I have always had an issue with the heavy coat of paint found on the original Swiss SANs sights (front and rear). Anodizing just looks so much more professional and clean. Front blade is fixed like the originals and I choose the N+ in terms of the original 550/1/2 Sight Heights as it is the tallest and if needed you can file it down. Original / OEM SWISS SANs 550/1/2 Rear Diopter Sight that has been Welded on the top of the 556 Receiver. MFI Rear Diopter & Rail Sight Combination that REPLACES your 556 top rail. 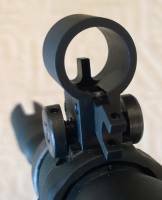 OEM SWISS SANs 550/1/2 Rear Clip On Diopter Sight that requires modification to the top of the 556 Receiver.